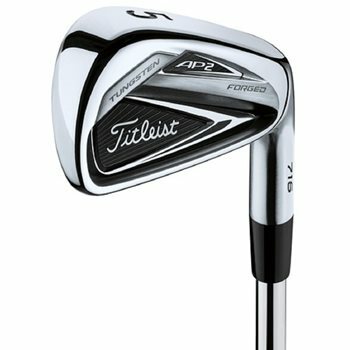 The Titleist AP2 716 Forged irons deliver tour proven performance, looks and feel. These irons feature an advanced performance design with forged 1025 carbon steel, co-forged tungsten weighting in the heel and toe (3-7 irons) and a lower CG that is better aligned for impact and consistent speeds. The use of the tungsten moves weight to the perimeter increasing MOI for speed on off center hits offering more forgiveness. The Titleist AP2 716 irons are the most advanced, solid feeling and forgiving Tour played irons that Titleist has ever created. Review by Will, 1 year ago. Review by MW, 1 year ago. Review by Liam, 1 year ago. Review by Gabe, 2 years ago. Review by Roger, 2 years ago. Unfortunately, we do not have actual photos of our used clubs due to our extensive inventory. Everything is given a condition grading and then accurately described for what to expect from that condition within the product features & specs description details. What brand/model is the "no label" shaft? With no label on the shafts, we are unable to verify the brand and model. We are able to determine the flex based on the step pattern of the shaft.